Sixteen-year old Hailey Trosclair’s family is going through a tough patch in the midst of a tough life in a lower class neighborhood in New Orleans. Recently her mother had a miscarriage and her father lost his job. After the miscarriage her mother turned to religion to heal her family but neither Hailey nor her older brother Cyrus could embrace it as fully as she did. In fact Hailey questions why her family has to face so many hardships if her mother is praying all the time. The answer she gets comes from an unlikely source, failed preacher and ex-con, Moses. He tells her that sometimes things have to get worse before they can be saved and what unfolds from there definitely proves that point. 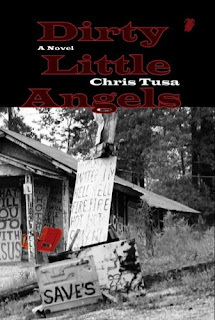 Dirty Little Angels is a dark and gritty story with characters so real I swear Tusa is writing about people I know. He captures Hailey’s voice along with her growing angst perfectly and the secondary characters are remarkable and I especially loved the way the title ties into the story. The writing flowed perfectly chapter after chapter but the reason it’s not rated higher is that I wish the story had more depth. There was no build up or intensity and although there is a shocking conclusion the book didn’t have the page turning affect I expected from such great writing.